At a recent Institute for Creation Research event, we passed out cards so the audience could submit questions for an upcoming Q&A session. Interestingly, several folks asked the same thing: Why don’t we find human remains in all the vast rock layers from Noah’s Flood? Though it’s a popular question, it carries one big assumption. Once that’s exposed, possible answers become more clear. Many assume that dinosaur layers should also contain human fossils. Not at all. 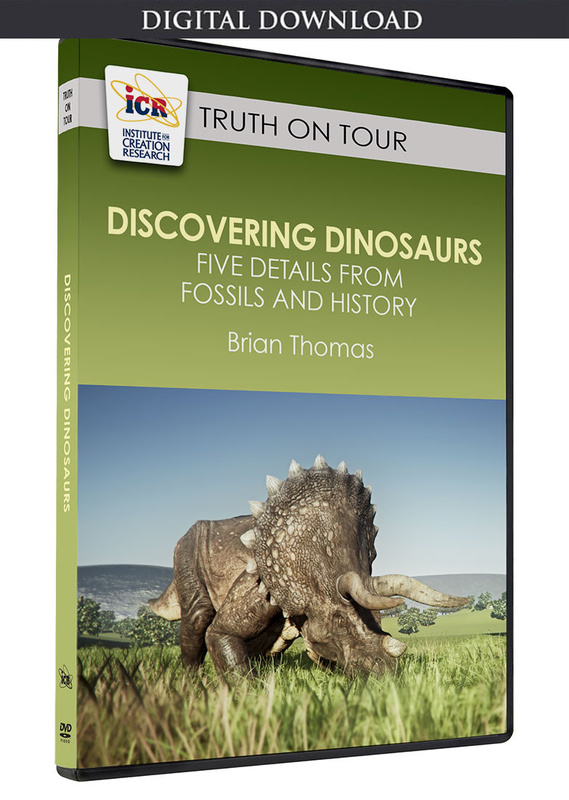 Dinosaur fossil layers contain sea, swamp, and lake plants and animals, and mostly water birds.1 They have virtually no remains of land-dwellers like dogs, deer, bears, or bunnies. Humans live on solid ground, not in swamps—and definitely not in pre-Flood swamps where dinosaurs might treat them as light snacks. The best places to look for fossils of pre-Flood humans would be in deposits that contain land-dwellers like pre-Flood dogs and deer. The best places to look for fossils of pre-Flood humans would be in deposits that contain land-dwellers like pre-Flood dogs and deer. Now we can reconsider the question. In short, three factors hinder the search for pre-Flood human remains. First, we are not sure where to look. Most Flood-friendly geologists have identified Cenozoic rocks as Ice Age layers that formed soon after the Flood. Others have recently reconsidered them to be Flood deposits.2 So, we haven’t been looking for pre-Flood humans in rock layers we thought were deposited after the Flood. 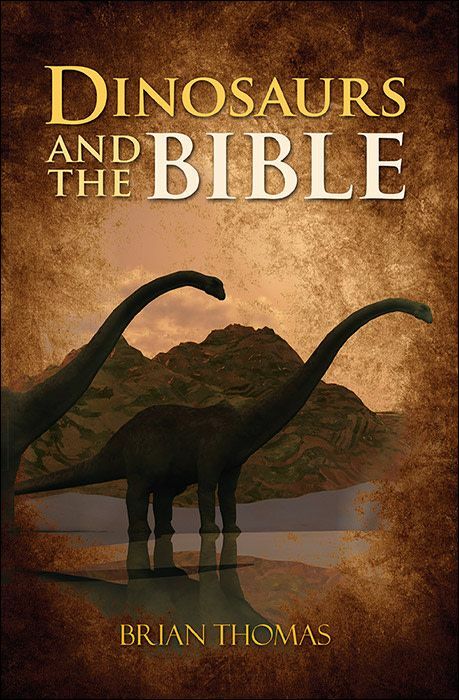 A new generation of Bible-believing fossil experts might do well to scour Cenozoic rocks for pre-Flood human remains. Second, ICR geologist Dr. Tim Clarey’s new continent-wide rock layer maps have revealed that many Cenozoic deposits lie offshore since Flood waters washed off of continents and into today’s oceans.3 It’s hard to dig for fossils in layers trapped beneath the sea. Plus, the violence of Flood runoff waters may have pulverized any human remains they carried. A third factor is a lack of objective workers. Evolutionary scientists might not admit to a human fossil that’s out of place with their manmade view of history. In 2011, a team described a perfectly formed human foot bone—the fourth metatarsal. It came from earlier-than-expected layers. Remarkably, they decided that some kind of extinct ape had human feet.4 Similarly, a 1980 report described human footprints at Laetoli in Tanzania. The evolutionary age for the track layer was over three million years—long before modern humans were supposed to have evolved. Therefore, researchers concluded that ape-like human ancestors walked just like humans.5 They should have just admitted that people were walking before they expected. What would these kinds of scientists say about human remains in rock layers they think are 10 or 20 million years old? Secular scientists imagine eons of pre-human creatures. Those many resulting bones, if they existed, would have blanketed Earth. Where are they?6 The few human remains available from Ice Age cave burials7 or older fossils8 look like the number we expect from our few ancestors who lived right after the Flood.9 Thus, we need new scientists without evolutionary bias who trust the God-revealed history in Genesis to search likely spots. We need new scientists without evolutionary bias who trust the God-revealed history in Genesis to search likely spots. With few workers to search, few who know where to search, and the destructive forces of Flood runoff, we should not really expect to have found the remains of pre-Flood people. Clarey, T. 2015. Dinosaurs: Marvels of God’s Design. Green Forest, AR: Master Books, 36. Clarey, T. 2016. The Ice Age as a mechanism for post-Flood dispersal. Journal of Creation. 30 (2): 54-59. Clarey, T. 2017. Local Catastrophes or Receding Floodwater? Global Geologic Data that Refute a K-Pg (K-T) Flood/post-Flood Boundary. Creation Research Society Quarterly. 54 (2): 100-120. Thomas, B. 2011. “Lucy’s” New Foot Bone Is Actually Human. Acts & Facts. 40 (4): 17. White, T. D. 1980. Evolutionary Implications of Pliocene Hominid Footprints. Science. 208 (4440): 175-176. Thomas, B. 2015. 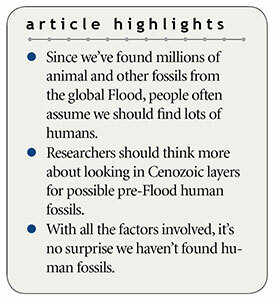 Pre-Flood Human Fossils Revisited. Acts & Facts. 44 (11): 14-15. Thomas, B. 2017. Who Were Cro-Magnon People? Acts & Facts. 46 (12): 20. Thomas, B. Human Evolution Story Stumbles Over Footprints. Creation Science Update. Posted on ICR.org April 6, 2010, accessed July 16, 2018. Cite this article: Brian Thomas, Ph.D. 2018. Where Are All the Human Fossils?. Acts & Facts. 47 (9).